Scene from "Calling Hedy Lamarr "
Calling Hedy Lamarr is a film about the legendary Hollywood diva and so-called "most beautiful woman of the world" Hedy Lamarr (alias: Hedwig Maria Kiessler). It is hardly known that the famous actress was also a visionary inventor. Hollywood didn't provide opportunities for female smart minds and so her invention was kept a military secret. Her electronic technology enabled allied torpedoes in WWII to hardly ever be detected and is still used today. 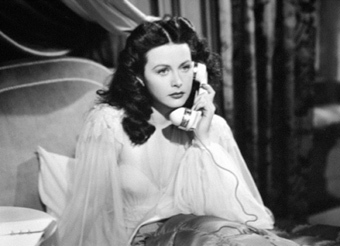 While her patent on frequency hopping is also the basis of all modern mobile communication, Hedy Lamarr never made a single penny with this mind-breaking technology. Georg Misch was born in 1970 in Esslingen and studied Film and Media Studies at the National Film and Television School in London and at the University of Stirling. Since 1997, he has been working as a freelance director for documentaries, features and commercials. A selection of his films includes: Insight (short, 1997), Lifestories: Douglas Bryson (short, 1997), It's About Time (1998), Ere We Go (documentary, 1999), Lines (short, 1999), Style Tribes - Fashion (2000), I am from Nowhere (documentary, 2002), and Calling Hedy Lamarr (2004).